Information on Founders’ Day will be emailed or posted very shortly to all Old Cryptians on our Membership List, and to those who attended in 2015. The forms are also available for download by following links under Activities/General – 2016 Programme. SAVE THE DATE! Monday 27th June will be a great day in the School and the Old Cryptians’ Calendar. In the morning Bob Timms, our incoming President, will host the Annual Golf Competition at Rodway Hill, Highnam, with Crypt boys competing with Old Cryptians for the impressive Tony Beard Cup. The traditional Cathedral Service will take place in the early evening and this will be followed by a Supper in the historic Parliament Rooms where Richard Briggs, after a year of service, makes way for Bob Timms, a long standing member of the Old Cryptians Club Committee. Look out for the invitation and acceptance forms which will be emailed, posted and displayed on this site. Catch up with the latest programme of events by reading Discover DeCrypt eNews. The committed Project Team are working hard to raise awareness about this exciting project centred on St. Mary de Crypt Church and the associated Tudor Schoolroom. Find more on this site under Activities/General. The AGM of the Old Cryptians’ Club will be held at Gloucester Rugby, Kingsholm tomorrow, 12th March beginning at 6.45 p.m. The relevant papers have been posted on this site at Activities/General – 2016 Programme – AGM 2016. Invitations to this year’s function on Saturday, 12th March have been sent out to all Old Cryptians on our membership list. For more information, and to download the forms, please look in the Events Diary on this site. 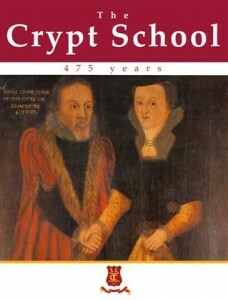 We welcome everyone with past or present connections to the Crypt School, not just members of the Old Cryptians Club. A group of Old Cryptians together with five Crypt pupils from Gloucester travelled to London on Sunday to take part in the Nation’s Act of Remembrance – the Parade at the Cenotaph followed by the March to Horseguards Parade. To be included is a very great honour for the School and the Old Cryptians’ Club. A full report will appear in the Cryptian. Copies of this amazing book, a story and a rich photographic record of the Crypt School, are still available, now at the special price of £10. Please contact Howard Allen at howardallen80@btinternet.com or on 01452 812638. Updated order form here 475-Book-order-form, v2. This was an expensive production in the 475th anniversary of the Crypt and your support will contribute to the financial health of the Old Cryptians’ Club. Are Old Cryptians aware of the fantastic venture founded by a prominent OC – James Roose-Evans? Recently James founded Frontier Theatre Productions which aims to highlight the contribution that older actors can make in a world obsessed by youth. Big name actors are backing the project and, as well as a London base, a programme for the next 12 months has been established. Frontier TP has received charitable status and there is thus the opportunity to back this fledgling company by becoming an angel at an appropriate (and tax efficient) level. Sue Wales of the School Secretariat is now assisting Nino Pelopida of the Old Cryptians’ Committee and will be contacting all members, via email and post to confirm personal details. If you don’t reply your copy of ‘The Cryptian’ magazine may be delayed! With Ms Wales on board the updating process should be much quicker. Those who have already contacted Nino need take no further action. Once again, if you have any queries, please contact Nino on 01722 324094. Thank you. Nino Pelopida (1955-63), a member of the Old Cryptians’ Committee, is emailing members to update details that are held securely on our membership database. If you would like to contact Nino to discuss this exercise (or in fact to pre-empt an email), please contact him on 01722 324094. It is important to have correct postal addresses in advance of the summer holiday posting of the Cryptian. Thank you for your co-operation. Fancy taking on one of the largest-scale choral works in classical music history? The South Cotswold Big Sing Group (SCBSG) are running a workshop this month on Gustav Mahler’s Symphony no.8. The refurbished St Mary DeCrypt Church and Old School Classroom in Southgate Street, Gloucester is now open to the public on Tuesdays to Sundays and well worth a visit. Please see the Discover deCrypt website for all the details. The School are delighted to announce that Wave 14 for Free School Applications has now opened and are in the process of writing an application for a Primary School which will be submitted in September 2019. If you would like more information The School will be holding an information morning in the very near future and a date will be published shortly.